The love/hate relationship between the WWE and Bret hart began in 1997 after Montreal. However, 20 years later, after seemingly reconciling several times, the WWE and Bret Hart are on bad terms once again, with negative lines about Bret Hart being regularly scripted on to TV. This is most likely in response to Bret Hart’s negative comments about Triple H and various other WWE talents over the years. In addition to that, Bret and the WWE are also on bad terms over the fact that the WWE Network were forced to pull Stampede Wrestling episodes, as Bret Hart owns all the footage that has him in it. Bret's parents gave him the rights to his content before they passed. Hart contacted WWE attorney Scott Amann and said there would be an issue if the footage wasn't removed. Bret then sent a copy of the agreement between WWE and Ross Hart, which stated that Bret did own the rights to all footage involving him. Vince McMahon was then subsequently forced to remove all Stampede footage from the WWE Network. The Montreal Screwjob was the real life double-crossing of defending WWF Champion Bret Hart by Vince McMahon, during the main event match of the 1997 Survivor Series held on November 9, 1997, at the Molson Centre in Montreal, Quebec. A secret change of the match's pre-determined finish (known as a "screwjob") was devised by McMahon and discussed with Hart's match opponent, Shawn Michaels. The "Montreal Screwjob" is undoubtedly the most controversial match in the history of the WWE. Hart was ostracised by McMahon and refused offers of induction into the WWF Hall of Fame. 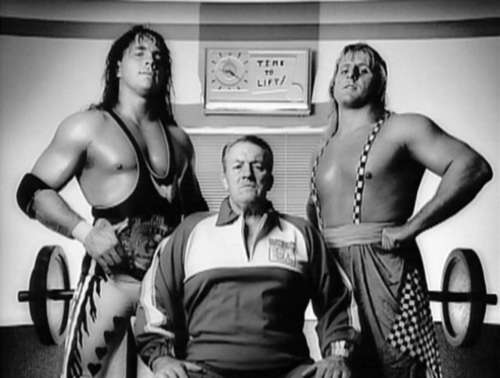 The Hart family expressed outrage with McMahon and WWF for their neglect and the lack of safety precautions that could have prevented Owen Hart's later accident and eventual death in 1999. However, he only agreed to take part to avoid the DVD being a negative burial of his career. Originally, the DVD was to be named Screwed: The Bret Hart Story, and would have been a film focusing on the negative aspects of Hart's career, much like WWE's The Ultimate Warrior DVD, The Self Destruction of the Ultimate Warrior. It originally featured derisive interview comments from former opponents like Hulk Hogan, Shawn Michaels and Jerry Lawler, with whom Hart had real-life personal issues (Hart has since made amends with Michaels and Lawler). Hart said of the project: "It was kind of a smear. It was basically a platform for guys to express their dislike for me and their jealousy." Hart was not slated to contribute to the documentary, but later agreed to participate, claiming that WWE essentially told him: "Get on board or we'll run you over.” Hart also entered the Hall of Fame in 2006 but refused to participate in an angle at WrestleMania 22. He even refused to attend the event. Hart re-signed with WWE in late December 2009. On December 28, after weeks of controversy surrounding Hart and his presence in World Wrestling Entertainment, Chairman Vince McMahon announced that Hart would be the special guest host on the January 4th episode of Raw. Hart made his first live appearance on Raw in over 12 years by hosting the program. There, he thanked the fans for their continued support, jokingly teased announcer Jerry Lawler about their long-running 1990s feud, and confronted Shawn Michaels and Vince McMahon regarding the Montreal Screwjob at Survivor Series in 1997. Hart and Michaels were able to agree on a truce, shaking hands and hugging. While many cast doubts on the sincerity of their reconciliation, both men have confirmed that it was indeed genuine and not part of a storyline. It also appeared that he had buried the hatchet with Vince later in the night until he subsequently kicked Bret in the crotch (this was, in fact, part of a storyline, as Bret and Vince have been on speaking terms since 2005). This set up a match between Vince and Bret at WrestleMania 26, which Bret won. Bret has stayed involved with the WWE ever since, even taking a role as the general manager on a short-term basis. However, in the last five years, Hart has publicly attacked Triple H several times, rating his match against Undertaker at WrestleMania 28 a 4 out of 10. "I'd like to tell Bret Hart, please don't get hot. What are you mad at, Bret? Bret, you're one of the greatest Superstars of all time. You're a multimillionaire. You're a legend in Canada. You're a legend around the world. I personally like you very much. You've been very great, great, to me your entire career, but what are you mad at? You come out and you talk about Michael Hayes, The Freebirds, and you bash Michael Hayes, [saying] he shouldn't be in the [WWE] Hall Of Fame. But you don't say anything about Sting, who didn't make his name in the WWE. What in the world is Bret Hart mad at?" On the subject of Hart claiming that Rollins is unsafe in the ring, JBL said that people get hurt all the time and that Hart of all people should understand that. "What about Seth Rollins? He claims that Seth Rollins hurts people. I mean, people get hurt in this business. Look, Bret was one of the greatest wrestlers of all time. People get hurt all the time. I think Bret should understand that. I'm not sure what has made Bret, appealingly, so bitter." JBL went on to say that Hart should not be bitter over Goldberg cutting his illustrious professional wrestling career short and instead focus on the positives. Bret Hart has just beaten prostate cancer, something the WWE should be celebrating on TV. However, instead of portraying Bret as a hero, they are scripting jibes at him. Meanwhile, Bret continues to critique WWE talent and employees. Most recently he has criticised Seth Rollins for being unsafe and disagreed with Michael Hayes being inducted into the Hall of Fame. Prior to that, he has attacked Triple H many times, blamed Samoa Joe for injuring Tyson Kidd and criticised the WWE for booking a screw job finish at Payback 2015. Bret Hart’s next comment can’t be far off, while WWE will continue to use mouthpieces to bash Bret Hart on TV, meaning the vicious cycle will simply continue. I will always side with Bret Hart. I don't think Bret is a bitter person. His opinions do not scream 'bitter' to me. Are we forgetting that this is a man who grew up in a family that relied on Professional Wrestling to live? Maybe his opinions shouldn't be dismissed so easily? Maybe you recall the occasion where he got screwed over by the company he stuck with through thick and thin? Or how about the time his brother was killed in a tragic accident, while working for the WWE, by reverting to a gimmick he never wanted to do? Remember when he went to WCW only to be drained of any passion for the sport he dedicated his life to? Only to have it climax by being kicked in the head through a botch and having a stroke as a result. Saying Bret needs to stop being so 'bitter' or 'hung up' about X, Y and Z is such a shallow a naive viewpoint. The WWE should be doing all they can to make sure they do all they can for Bret Hart. He’s been through a lot, and most it stems from the WWE.